I fielded four calls before I finally found out that my name and number had been posted on a bathroom wall. It’s not as bad as it sounds. My contact info, along with my picture, are on a poster on the bathroom wall where one of the grands is potty training. When she has a success, she chooses someone to call and then that person emotes through the phone, shouts, yells, claps and cheers her on to greatness. Or dryness. The husband just got a text saying that if he doesn’t turn his phone on and take a few calls he’s going to be deleted from the call list. Just like that, Grandpa could be history. The world of potty training is brutal. Always has been. 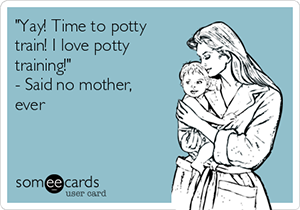 Potty training is right up there with your kid getting a driver’s license—a milestone that you, the parent, simultaneously look forward to and dread. When my daughter said she was using the “Potty Training in a Day” method, I didn’t say anything. When she said you give the child a doll that goes potty, I didn’t say anything. When she said you give the child salty snacks and drinks and have them practice running to the potty, I didn’t say anything. When she said you reward the kid with M&Ms, I finally said something. “Somebody gave me a book just like that when your brother was born,” I said. “I started the ‘Potty Training in a Day’ method on a Monday and threw the book out on Thursday. Of course, these days there are endless options when it comes to potty training today. There’s “Potty Training Your Child in a Week,” “Potty Training Your Child in Three Days” and “Potty Training Your Child in Less Than One Day.” I would think the Less Than One Day method would be far more appealing (and expensive) than Potty Training in a Week. Who wants to drag it out if you don’t have to? To our daughter’s credit, she was more diligent than I was and her little girl was ready and caught on quickly. Also, to our daughter’s credit, she didn’t post any pictures of it on Facebook. Despite the recent family success with “Potty Training in One Day,” my favorite approach floating around right now is “The Naked & $75 Method,” which comes from John Rosemond. You let the kid run around naked for three days, the theory being that the kid won’t like the mess and will get to the potty on his or her own. The $75 is for cleaning the carpet. Since the people we most often dine with on the patio are grandchildren who go to bed at 7 p.m., we are rarely outside after dark and able to enjoy the ambience of flickering candles or string lights. Ambience with grandchildren consists of greenish night lights that automatically come on when the room gets dark. When friends who have been known to stay up until the wild hours of 10 and 11 joined us for a late dinner, I immediately wove 40 feet of tiny fairy lights through a tree that overhangs the patio. Ambience at last. When the sun went down and the lights went on, the husband commented that none of the lights were in the top, or even in the middle, of the tree. “They’re all low like they were hung by someone 5 ’2,” he said. So did our friends, who stayed until 10:30. 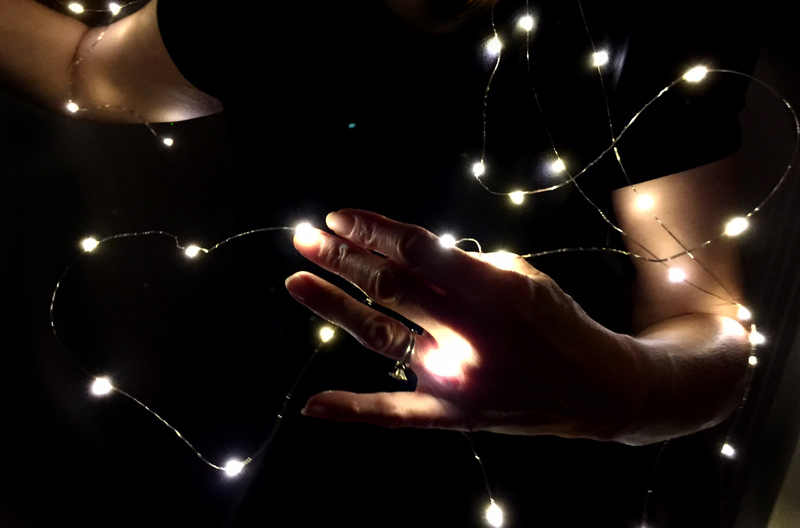 We said goodbye on the front porch and I went back outside to retrieve the fairy lights, gently pulling them from the branches, draping them around my neck and across my arms, so they wouldn’t tangle. If it had been December, I could have stood in the front yard and doubled as a Christmas tree. I walked back to the house and discovered the screen door was locked. I knocked softly. No answer. I knocked louder. Still no answer. “Anybody home?” I called, but not too loud, as it was now after 11. Pacing the patio with tiny glowing lights draped over me, I realized if one of the neighbors looked outside they could report a UFO, and a helicopter with a blinding searchlight would be sweeping the backyard at any moment. I cut the lights. It was pitch black. I peered in the house again and saw the bathroom door was closed. Being a cloudless night, I walked to the middle of the backyard to get a good look at the stars. Talk about ambience. I walked back to the house. The bathroom door was open, but the husband was nowhere in sight. I thought I heard a raccoon rustling in the bushes. Or a ‘possum. Probably both. All of a sudden there was a glow casting on the lawn. It was from the light in our upstairs bedroom. Great. The man was probably going to bed. When would he notice I wasn’t there? Midnight? Two a.m.? A week from now when he stumbled across chunks of my hair raccoons had ripped out and scattered beneath the grill? I pressed my nose to the screen door again. Futile. Then I remembered that some of the grands had put a rip in it not long ago. Yep, I could reach through, tear it a little more and unhook the door. There is a beetle in my freezer. And he’s not there by accident. I caught him, I boxed him and then I froze him. If you’re an insect lover, you may want to stop reading now. But before you leave, know this—there’s no better way for a bug to go. Millions of them go like that every fall with the first hard freeze. Initially, I felt a bit remorseful about freezing a bug, but then I realized I was merely hastening nature’s cycle. I only hope the beetle saw it the same way. In any case, the beetle is in the freezer on top of a pack of ground beef and between two bags of frozen vegetables. Now, if I peel the lid off that box in two weeks and find the beetle is missing, I will probably throw out the ground beef, the vegetables and everything else in the freezer. It is my son and 5-year-old grandson’s fault that there is a beetle in the freezer. Frankly, I often gag slightly when I hear about their latest exploits. Then, before I know it, I am taken in the by the excitement and doing things I never envisioned doing—like catching insects and casually popping them in the freezer. They recently bought a casting resin kit (liquid plastic that solidifies in an hour). A lot of crafters use the kits for making jewelry or preserving leaves. Our son and his son are using the kit to preserve insects in test tubes. I suppose their bug casts could double as jewelry, but I don’t think they will become a fashion trend anytime soon. Shortly after they told me about the project, I spotted a shiny black beetle crawling on some brick. Every fiber of my being wanted to crush the beetle, whack it with my shoe, flatten it with a rock (I’ve been very pent up lately), anything but catch it. But when I considered what a little boy can learn studying the wonders of creation up close, I was suddenly on board. Apparently, I was so on board that when I called to let them know that I had a specimen in my freezer, I suddenly, unexpectedly, with no forethought whatsoever, heard myself commit to scoring an earwig. Who am I? I cannot even say the word earwig without screaming. Earwigs: bugs that slither into your ears while you sleep and spin wigs, right? Maybe not, but if not, why do they call them earwigs? They’re disgusting. And now I’d committed to finding one. Just like that, I’m an entomologist. Or an etymologist. Or both. Unbelievable. Of course, there’s always the chance I won’t come across an earwig under a mound of mulch or in the seed pods on the false indigo where they hang out every year. But if I do, I am honor bound to try and catch it. We always look at Google maps or MapQuest before taking a trip to see how long the trip is supposed to take—and then do our best to prove them wrong. We’re no amateurs – we have gotten this down to such a science over the years that there are certain family members deathly afraid to travel with us. But since our family keeps growing (a son-in-law here, a daughter-in-law there, a new grandbaby or two every few years) we are still able to find the uninitiated willing to pile in the car. Recently, we embarked on a 500-mile trip that was supposed to take 8 hours. Based on past experience, we were pretty sure that was wrong. Our fellow travelers arrived at 6:40 a.m. We unloaded bags from their car, transferred two car seats from their vehicle to our vehicle, loaded a cargo carrier on top of our car, changed diapers, readjusted the carrier, inspected the car seat installations again (multiple times), crammed diaper bags, a cooler, snack bag (essential), assorted reading materials, one laptop and large bulky purses into our vehicle, then rearranged items in the carrier, put out an all-points bulletin for a missing pacifier, redistributed items in the vehicle six more times and then, using precision origami folds, crammed Grandma into the far back seat next to a car seat and departed at 7:30. We made our first stop at 7:32. We wheeled into a strip mall parking lot to deposit an envelope into a mailbox. Yes, the husband could have left it in our mailbox but, as he noted, we have had mail stolen from our mailbox. Once. In 1993. We are nothing if not paranoid. We were back on the road and made our second stop at 7:36, pulling in line at a drive-through for coffee. There was no cream at home and the husband takes cream. Listen, you don’t want the pilot drowsy in the cockpit. Back on the road, topping speeds of 32 mph, hitting every red light on the way to the interstate, someone asked if anyone was hungry. 7:40. Not to worry, we didn’t need to stop, as they brought food — a bag of chocolate-covered doughnuts. I argued that plastic-coated doughnuts were not a food and was met with strong opposition declaring them delicious and even claiming that they qualify as “eating clean” if you wipe your hands with a Wet One when you finish. In the midst of the Plastic Doughnut Debate, a dark cylinder bounced on the road in front of our vehicle. Someone said it might have been a muffler—or a curling iron from a cosmetic bag in the overhead carrier. Maybe we should pull over and check the carrier. Why not? It was 7:46. It only took us an hour and ten minutes from the time our travel companions arrived and loaded until the time we finally hit the interstate. Given our current rate of travel, I calculated we should reach our destination by sundown. In two or three days. Once again, that 8-hour prediction had been way off.